As we make our way through Q1 of 2019, let’s look back on 2018 and analyze how funding in the IoT sector compares to previous years. 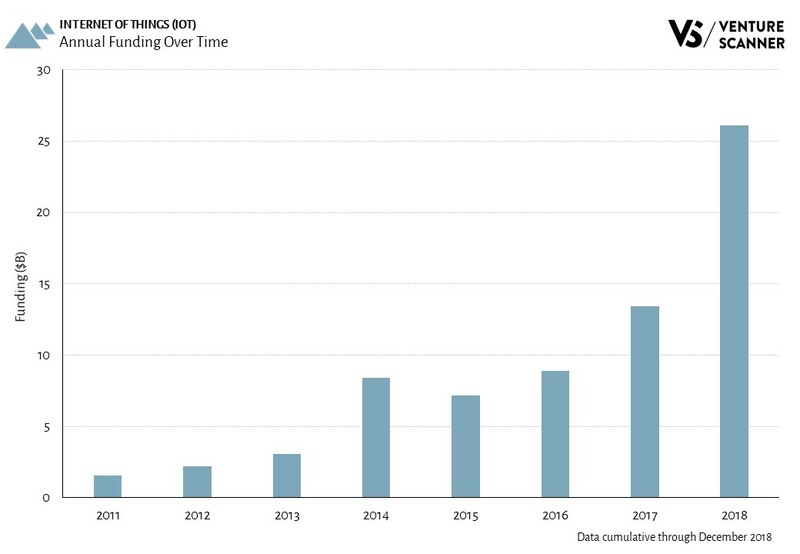 The graphic below shows the total annual IoT funding amounts over time. The internet of things (IoT) industry has seen $77B in total all time funding. Let’s analyze the investors making bets into IoT and identify the most active firms. 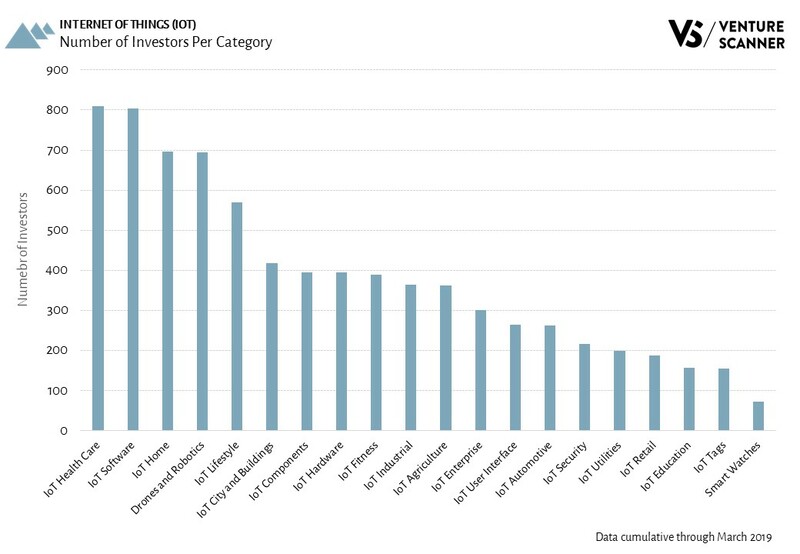 The graphic below shows IoT investors based on their number of investments into the sector. If an investor participates in two investment rounds in the same company (such as a Series A and Series B), that would qualify as two investments for this graphic. 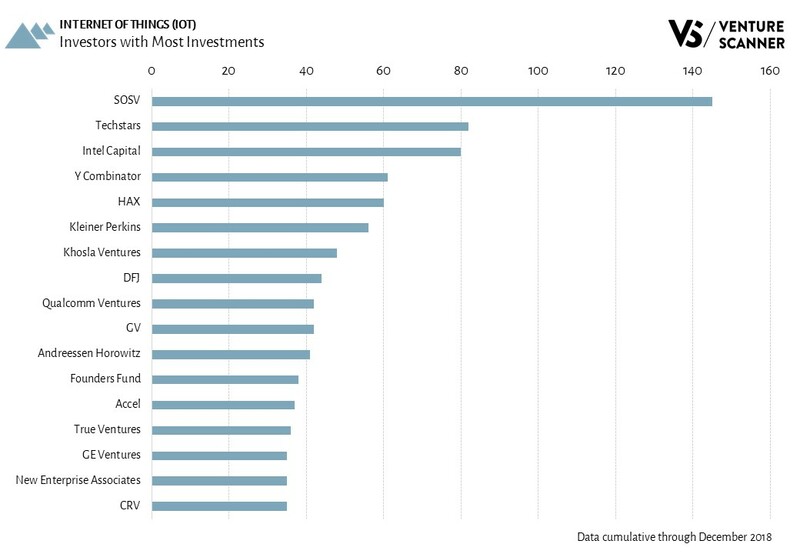 As the graphic demonstrates, SOSV has made the most bets in the IoT sector with 145 investments. Techstars follows with 82 investments. Examples of companies that SOSV invested in include Leap Motion, Particle, Nura, and Bloomlife. It’s interesting to note that Intel Capital, Qualcomm Ventures, and GE Ventures are on this list, as sometimes they operate as corporate investors in this space. Let’s see which investors make their way onto this list in 2019! Now that 2018 is complete, let’s see how exit activity for the internet of things (IoT) compares to previous years. The graphic below shows the total annual IoT exit events over time. 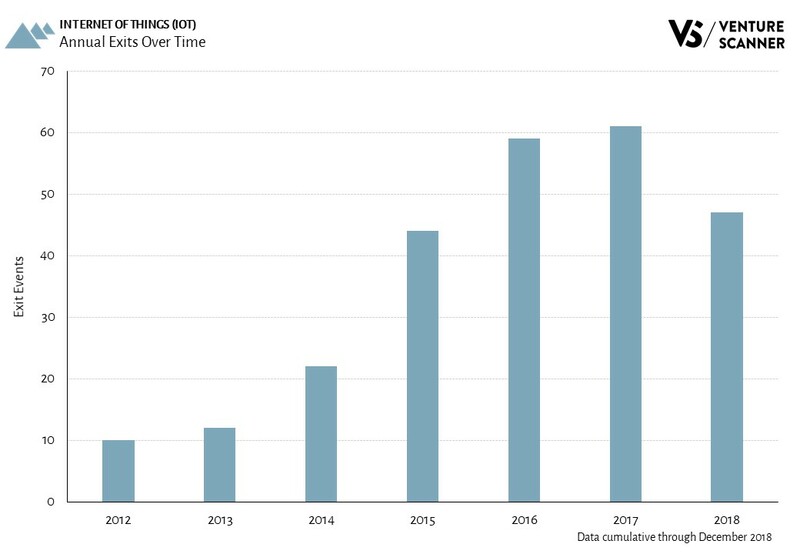 As the graphic demonstrates, 2018 saw a dip in IoT exit activity compared to the previous year. The 47 exit events in 2018 represent a 23% decrease from the 61 exit events in 2017, which was the highest year on record for exit activity. However, IoT exits are still on a general upward trend, with a 5-year CAGR of 31% from 2013 to 2018. Let’s see if the IoT exit activity in 2019 will jump back up to the 2017 level. Our Innovation Quadrant divides the internet of things categories into four different quadrants. 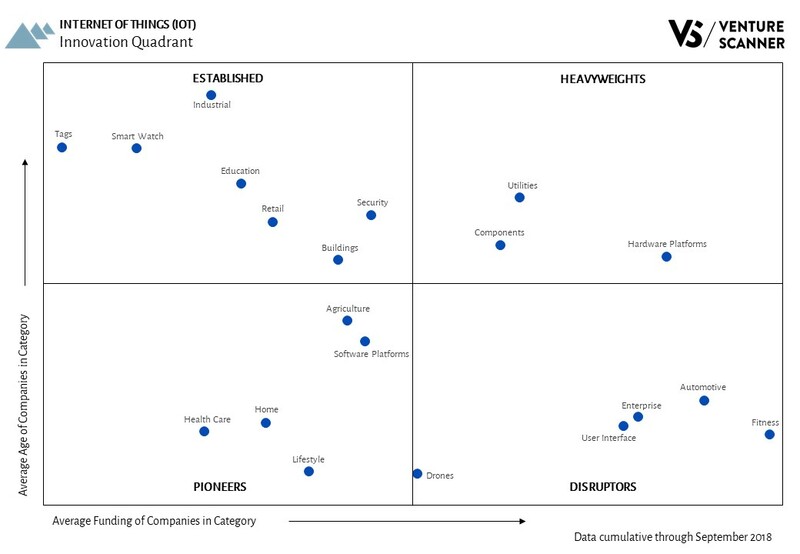 We see that the Established quadrant has the most IoT categories with 7. These categories have reached maturity with less-than-average financing. The Pioneers quadrant has 5 categories that are in the earlier stages of funding and maturity. The Disruptors quadrant also has 5 categories, which have acquired significant financing at a young age. The Heavyweights quadrant has 3 categories that have reached maturity with significant financing. We’ve analyzed the IoT categories and their relative stages of innovation. Let’s now look at how they stack up against one another in terms of their total funding versus company counts. 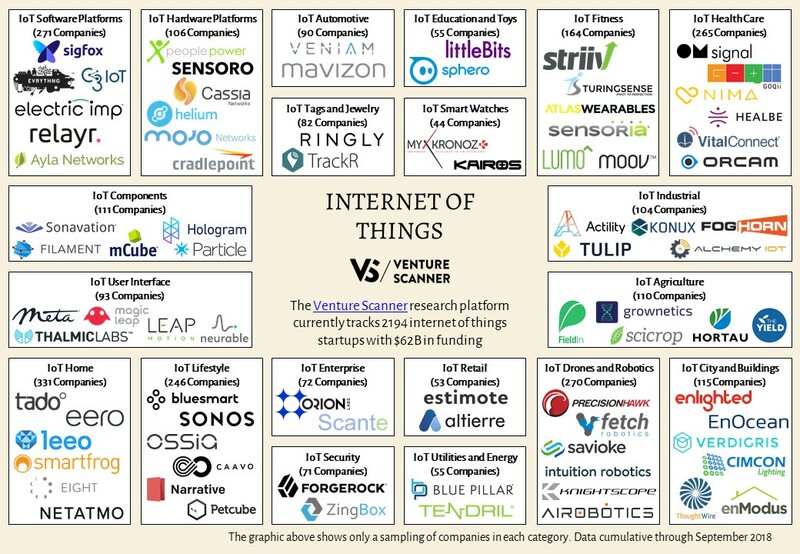 As the above graphic implies, the IoT Fitness category leads the sector in total funding with $7.6B. IoT Software Platforms and IoT Drones follow in second and third places with $7.4B and $7.3B in total funding, respectively. 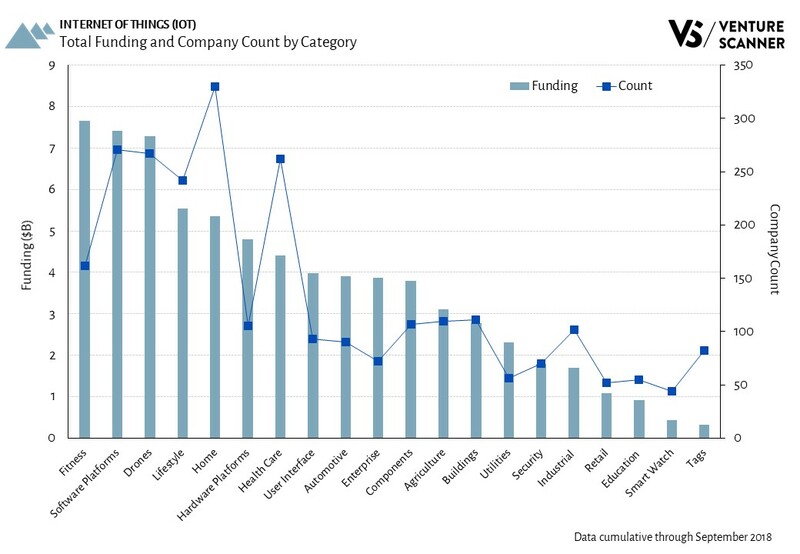 As the analysis above demonstrates, the IoT Home category leads the sector in total companies, and the IoT Fitness category leads in total funding. We’ll see how the IoT landscape evolves and develops in the new year! To learn more about our complete internet of things report and research platform, visit us at www.venturescanner.com or contact us at info@venturescanner.com.